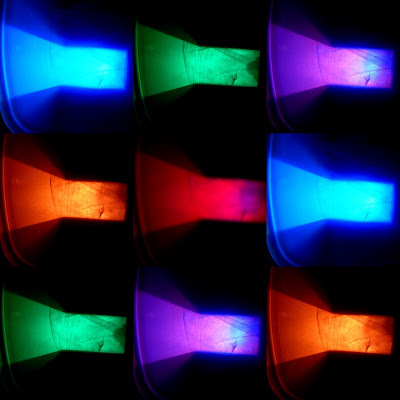 Here is the video of the mood light for the laminar nozzle water fountain. This is just a proof of concept to make sure that I can build and make it so that I can put it into the water fountain, because a water fountain is cool, but how much cooler would it be if it could GLOW! The video doesn’t do the light justice it has a lot of glare to it. It looks SOOOOO much better in person. First off, I would like to welcome my new visitors frequent visitors! Please contact me! I’d love to talk with you about my project! So this is part II because I needed to learn how to fade and mix the RED, GREEN, and BLUE so that I could pick the colors from the rainbow. To fade each of the Red, Blue, and Green colors individually in order to pick the colors of the rainbow. The setup isn’t much different from the past post. I just added more to it. This schematic was given to me from Mario a friend in Switzerland! Awesome schematic! It’s simple to build and it really makes sense once you study it out. I used a PIC uC PIC16F690, and the PIC KIT2 starter kit to program the microcontroller. I also used Proton+ to program the chip. The three different signals from the uC went to three different channels, RED, GREEN, and BLUE. Each pin used PWM (Pulse Width Modulation) to control the mosfet. 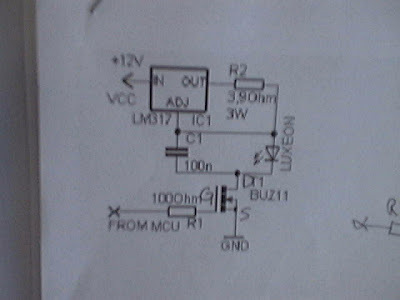 **NOTE: In the picture above the schematic shows BUZ11, that was replaced with IRFD024 and the resistor R1 was replaced with a 10K ohm resistor. R2 was changed to a 1.8 ohm @ 2W resistor. The PIC16F690 was hooked up to the mosfet via a resistor (10K). The K2 Star LED was hooked up to power from the LM317 which was hooked up in a constant current circuit constantly outputing 700mA actually something like 705mA if you want to be exact. Essentially how this circuit works is the mosfet is blocking the path of electricty to ground. As you can see the results are pretty spectacular! These are just a few of the colors. I was having difficulty with my camera and so most of the photos didn’t turn out. But it gives you an idea of what it will look like when you get yours finished! I’m uploading a video of it changing colors. Once it is done, I will come back and post it. I’ve made some significant progress this weekend! I extended the Glowy Green LED’s to Blue and Red. I also soldered up a circuit to power the LED’s instead of just hooking up each part individually. That got pretty crazy really quick with all the alligator clips all over the place. I’ll explain more later. The next part is to use the mosfets to allow the microcontroller to control the brightness of the LED’s. This will allow me to change the color and mix them as I desire. So, I’ve always been fascinated with mood lamps, green and blue glowy lights. I have, in the past, tried to make my own mood lamps. There is just something about the way that is changes color seamlessly from one color to the next. So, I’m trying it again. What’s going to make this time different and what does it have to do with a laminar nozzle? Both very good questions, I’m glad you asked. The lights are going to be for the fountain. I’ve always wanted a fountain, and I’ve always loved mood lights so why not combine them! The fountain is going to have some LED’s and some fiber optics which will port the light right up the center to the water. When the water shoots out the light will be able to travel right through the water just like fiber optics. I have a friend in Switzerland who is doing the same thing as I am doing. We share information back and forth. He has come up with a brilliant way to make the LED glow, and glow bright. Not to mention an easy way to the control the brightness of the light. Thanks to him I KNOW I cannot fail at this task. Currently I am just working with 1 Green 5W K2 star from Luxeon. This light is soooooo bright. The one light can light up the entire room as shown below. Just to give you an idea of how bright it is, a regular LED (like the one on your DVD player) uses 20mA of current. The K2 star is capable of using up to 1000mA. That’s 50 times more current!!!!!!! Because it uses so much current you can’t turn it on without it being properly heat sinked. That’s what that hugh chunk of Aluminum is. The heatsink helps draw the heat away from the LED and a fan blow over the aluminum and cools it down. Just so you know this is only 1 LED. I’m planning on have at least 3 more if not 7 more. I will also need to purchase some fiber optics in order to port the light into the fountain. This will be a challenging but really rewarding task once it is completed.